An easy on-point block designed to showcase a medium-sized novelty print (or embroidered patch). 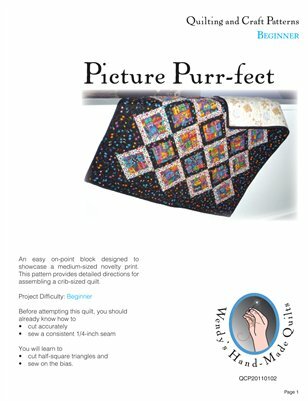 This pattern provides detailed instructions for assembling a crib-sized quilt. You should already know how to cut accurately and sew a consistent 1/4" seam. You will learn to cut half-square triangles and sew on the bias.